In which I wax poetic about … poetry. 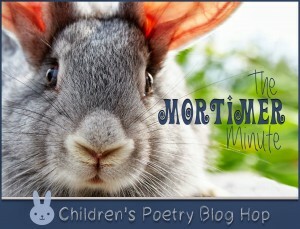 The Mortimer Minute Poetry Hop started in September with April Halprin Wayland, who asked poetry lovers to share questions and answers about poetry – especially poetry for children. I got tagged by Jacqueline Jules, an award-winning poet and children’s author whose poems and stories stay with me long after I first hear them. You’ll find her poetry questions (and answers) over on Debbie Levy’s blog. Her list of poems for kids goes on about a mile long, and you can see glimmers of poetry in everything she writes. My published poetry for children seems to have hit its peak with a counting book I wrote for the Dole Company a few years back — though I do tend to sneak it into my longer pieces, like Canary in the Coal Mine, whenever I can. I’m hoping you’ll see more from me in the next few years. Maybe answering these questions will spur me to submit! How do you feel about rhyme? The first non-rhyming poem I ever adored was probably Ole Ramson’s I Am a Bunny, though I didn’t realize it was a poem at the time. As an adult, I rediscovered narrative poetry through Sherman Alexie, starting with Summer of the Black Widows, and ending only if he ever stops writing poetry. I’m also a big fan of Jane Varley’s slice-of-life poems. In kid-world, in addition to Jackie, I really like Liz Scanlon, Marilyn Singer and Laurel Snyder. Like Johnny Cash, I’ll always have a soft spot for Shel Silverstein, and I consider it a triumph that my kids know Robert Louis Stevenson because they heard Bullwinkle recite The Swing on a the Rocky and Bullwinkle Show. It’s also lovely to find poetry hiding in plain sight — in a grocery list, or the Japanese-to-English translation for a soldering iron. Why do you like poetry? While it’s true that sometimes a good poem can take as long to complete as a full-on book, the length of most poems makes them seem deceptively doable, and therefore, not so threatening. I love poems for their concentrated bursts of emotion – my feelings (or yours) distilled, without the aid of a Bunsen burner. I love that they can paint a picture in so very few words. And I love poetry for its sound. I was reminded of that again recently when my friend Dana Kletter posted the words to Lewis Carroll’s Jabberwocky online — in Yiddish. The poem was already all about sound, but hearing it without knowing what a single word meant – and still being able to enjoy it – drove that point home. Why is poetry good for kids? Milk builds strong bones, poetry builds a strong sense of word play, helps them remember things, and offers them release. With poetry, they are given the license to be funny, silly and clever, as in my son’s poem about a group of vicious, doughnut-eating cows. They are given license to put some of their intense emotions into words, especially valuable for teens who need an outlet for their angst, who are are finding their voice. Thanks for tagging me, Jackie! Jackie also tagged my friend and writing cohort Anamaria Anderson over at Bookstogether, so be sure to check out her q&a, too. I’m tagging Mary Crockett, another slice-of-life poet I admire, for next week. Mary was a poet before she was anything else (author, wife, mother, Wonderwoman). My writing partner for the YA novel Dream Boy, which is due out this summer, Mary and I met when we were asked to co-teach a creative writing program for teenagers at the YMCA in Salem, Va. Look for Mary’s post next week! And a last note: I feel like in my own education — and today, in my kids’ education — poetry was barely given a nod, even during National Poetry Month. More, please. Since this blog hop falls on Poetry Friday, I’m going to double up, so I’m presenting this poem from Canary in the Coal Mine. I don’t think it’s a huge spoiler since I’m taking it out of context. Poetry Friday is hosted this week by Jama Rattigan; to invoke James Bond (and Carly Simon) Nobody Does it Better. This entry was posted in kidlit, poetry, Poetry Friday. Bookmark the permalink. Thanks to everyone for visiting! I do love to see Mortimer hopping around! Hi, Madelyn. Your post is sending me off to follow links. “The Swing” on Rocky & Bullwinkle?! “Jabberwocky” in Yiddish?! Thanks for sharing those. Great to meet you through this post. Sometimes it IS pig! =) Thank you for yours! It’s WIG! I love that. And then sometimes it’s, I don’t know…PIG! Thanks for being so generous with your minute–more is more. Wow! Love this post. You really packed a lot in your Minute. Learned all kinds of juicy things about you and your writing :). Love that you also shared “Sing, Little Songbird”. And Jabberwocky in Yiddish — who’d have thunk it?